NTUA implements the 3rd stakeholders’ workshop in the case study area of Rethymno in Crete, Greece. The workshop is organised with the support of Municipality of Rethymno and will be held at the Centre of Social Welfare of Rethymno, on 29th of September 2017. Members from all identified stakeholders’ groups will participate and interact during the event. Aim of the workshop is to finalize the participatory process with local stakeholders, which started since the beginning of the project. 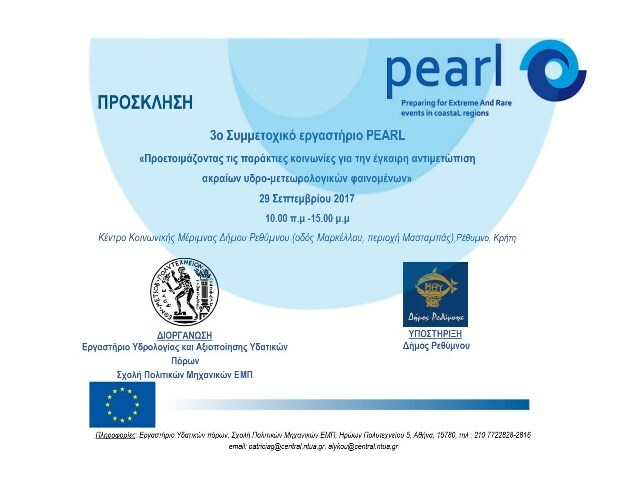 Key activities of this final event are targeting to the design of a commonly accepted Roadmap for flood risk management for the city of Rethymno, through the utilization of PEARL tools. Representatives from local and regional authorities, NGOs and private stakeholders’ groups will have the chance to interact with the Web based Learning Platform, PEARL KB, Water Detective and ABM tools. Presenting the results from modelling and research work for the city of Rethymno. Please note that the event target local stakeholders. The invitation (see image above) and workshop_agenda are therefore only available in Greek.